In this post I will talk about 6 out of the 12 casting layouts I have encountered. Which layout or spread you use is entirely up to you. Of course you don't have to even use a spread. You can just draw one rune and take what you will from it. When casting, you can use one of the five methods I mentioned in my casting runes post. Runes next to each other can either strengthen or oppose each other. 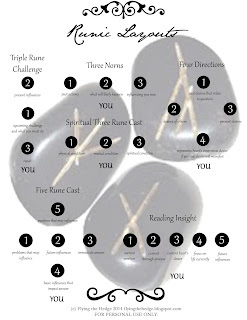 If they are opposing runes, they most likely cancel each other out, but its possible they represent what is wrong and what needs to be fixed. My next post will cover the Runic Cross, Seven Rune Cast, Runic V, Nine Grid, Tree of Life, and Futhark Cast. Is there a layout you use that I have not mentioned?